Photo: Late light walking by the sea. Think surfer vibes and hipster cafes, and Bali’s Canggu—pronounced “chang-goo”—is where it’s at. At the right time of year, the waves roll in, the sunset cocktails are perfectly positioned and the mood is chilled. But be warned: As with many of Bali’s southern beaches, during the monsoon (October to February), the onshore rubbish is frankly intolerable; and the villa development these days is so fast-paced it’s causing old-school punters to run further north to escape the scene. The main things to do in Canggu are simply surfing and eating. Yoga studios are blooming everywhere you look—The Practice, SamadiToo (for hot) and long-running Desa Seni boast stunning spaces—while the eclectic shopping is slowly going higher end, shifting away from the Bintang T-shirts and sarongs of yesteryear towards funky emporiums—there’s even a vinyl record shop among the offerings. Canggu in fact refers to two villages west of Kerobokan in the south of Bali. The first village to the west of Kerobokan is Tibubeneng, which is home to Berawa Beach and the Canggu Club. The next village to the northwest is officially Canggu proper, and this is home to Batu Bolong Beach and Batu Mejan Beach, better known as Echo Beach. The beach immediately to the northwest of Echo is Pererenan. Canggu as a whole offers a growing range of eating and sleeping options, many of which are excellent—the issue for those seeking peace and serenity is not the quality of each individual spot, but rather how many of them there are overall. As development marches on, villas with views of emerald rice fields are being replaced with villas with views of villas, with views of villas. Now, the charm of this area is shifting towards the hedonistic vibe of Seminyak, and at times it has the traffic to match. While they’re all pretty much a continuation of the same strip of sand, each of the beaches of Canggu has its own vibe. Berawa Beach is the closest to Seminyak (you can walk there along the beach from here) and has a large beachfront hotel. Next up Nelayan Beach swaps a hotel for some fishing shacks, while west still at Batu Bolong, beautiful Hotel Tugu resides along with Old Man’s, which has achieved iconic status in the few years it’s now been open. Echo Beach is the best known of the beaches in the area, with its sands crowded with beanbags and deckchairs, and a big selection of beachside barbecue joints to the left of the main road hitting the beach. Westernmost Pererenan Beach is the quietest of the lot. Hotel and guesthouse accommodation—everything from cheap backpacker hostels to luxury villas—is found along Jalan Pantai Berawa (pantai means beach), which dog legs near Bungalow/Milk and Madu, as well as Jalan Batu Bolong and then Jalan Batu Mejan, which also does a sneaky dog leg and runs down to Echo Beach. If you’re inclined towards a villa, check Agoda for Canggu villas at competitive rates as they list many (though not all) of them. Those seeking great food in Canggu will not be disappointed. Enjoy a beachview beer at Old Man’s, sample nouvelle Japanese cuisine at classy One-Eyed Jack, enjoy Gypsy’s breezy style, tuck into local cheeses and coldcuts at gorgeous Salumeria, or be impressed by the vegan fare at lovely Peloton. And that’s just for starters. Pretty much all restaurants and accommodation will offer free WiFi. ATMs are found along Batu Mejan towards Echo Beach and more are found along Raya Canggu. At most beaches you’ll be charged a small parking fee for your motorbike, generally 5,000 rupiah. Because of the local driver collective/mafia it can be close to impossible to be picked up by a registered taxi in some areas of Canggu, especially near the beach. Likewise for Uber, whose drivers will often refuse to pick-up in some areas. It is an unfortunate situation as the rates the local drivers charge are often extortionate—we’re all for supporting local communities, but their attitude is a difficult one to support. Last updated on 15th March, 2017. Browse our independent reviews of places to stay in and around Canggu. Read up on where to eat on Canggu. Check out our listings of things to do in and around Canggu. Read up on how to get to Canggu. Planning on riding a scooter in Canggu? Please read this.  Use the above map to find specific destinations in and around Canggu which are listed on Travelfish. Bed icons indicate a guesthouse, hostel or hotel, the knife and fork is an eatery or bar and the four-way circular thingy marks sights, attractions and other points of interest. Click on any icon for a short pop-up and a direct link to the page for that spot. If you are in the area, use the teardrop icon near the top left to show your position on the map (you'll need to allow position sharing for this last feature to work).